This is was our second Viking Ocean Star sailing. 1st one was May-June 2015 Viking Homelands. We loved it then and we loved the 2nd sailing just as much. Previous to the Viking Ocean Cruises we sailed on three Viking River Cruises. Danube, Rhine and Yangtze. Mediterranean Odyssey - October 2017 cruise only. We flew in 2days early with friends we met on Viking Ocean Star in 2015 and made our own arrangements in Barcelona, exploring many of the exiting city sites - La Sagrada Familia; Guell Park and strolled Las Ramblas from our Hotel on the same street. A third couple met up with us on board ship two days later. We extended our stay in Venice by 2days with hotel stay 3min. from Saint Marks Square which also offered complimentary water-taxi to Murano. Embarkation and disembarkation went without any delays; both in Barcelona and Venice. Our cabin-mid ship, Deluxe Veranda, which we saw briefly on a daily basis was very comfortable. Being avid dancers we enjoyed the sounds of Oaseas in the Torshav Lounge with Christina, Speedy and band. Polka was not in their repertoire but their keyboard player came up with the Beer Barrel Polka and the following night they played several Polkas - they were great. Other shows included a tribute to ABBA; The Long & Winding Road dedicated to the Beatles; Songscape: An Operatic Fantasy and more. You&apos;ll find unlimited activities on board ship throughout the day and evening. Enjoy the sounds of the Viking classical Trio, resident Guitarist or resident Pianist in the expansive and beautiful public Atrium. Relax in the Living Room, enjoy a drink with friends in the Explorer&apos;s Lounge, Aquavit Bar or Pool bar. Stay fit by using the well equipped fitness center; choice of three pools; Nordic Spa; Shuffle Board etc. Dining at its best - the choice is yours Manfredi&apos;s, Italian cuisine; The Chef&apos;s Table;The Restaurant, fine dining and the World Café, cafeteria style. Snacks and Lunch is also served at the Pool Grill and Mamsen&apos;s. Service throughout is exceptional. You&apos;ll find the Staff attentive, helpful, determent to please with a smile. If there is problem or certain need, they will aim to fix it resolve it quickly. Our schedule in regards to shore excursions was extremely busy...by our own choosing, which made it difficult to attend several of the on board activities we would have liked to attend as well. We had excellent, knowledgeable guides on all excursions we took - they ranged anywhere from 1 1/2 to 10 1/2 hours. Best way to truly enjoy your shore excursions is read up on the area in advance so you can make the most of the time in each area. Be prepared for steps and more steps. Anticipate crowds. Dress comfortably. We had a very mindful guide who did avoid certain areas in Barcelona at the time Catalonians were demonstrating in the city center. The weather was a fantastic....daily Sunshine, Blue Sky, Calm waters and daytime temperatures in the mid 70F. 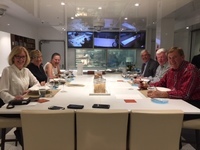 Our "three couple party" enjoyed a most memorable Dinner arranged at the Chef&apos;s Table by Tom Aberg, Hotel General Mgr., Martin Kitzing Executive Chef, Emir Tursik, Restaurant Supervisor- our attentive server at our celebratory Dinner; and Zrinka Kardum, Restaurant Manager. We each celebrated 55years of wedded bliss....making it a total of "165 years of Marriage!" Will we sail on another Viking Ocean Cruise? I&apos;m quite sure we will .....already glancing through the catalogue. This is was our second Viking Ocean Star sailing. 1st one was May-June 2015 Viking Homelands. We loved it then and we loved the 2nd sailing just as much. Previous to the Viking Ocean Cruises we sailed on three Viking River Cruises. Danube, Rhine and Yangtze. Mediterranean Odyssey - October 2017 cruise only. We flew in 2days early with friends we met on Viking Ocean Star in 2015 and made our own arrangements in Barcelona, exploring many of the exiting city sites - La Sagrada Familia; Guell Park and strolled Las Ramblas from our Hotel on the same street. A third couple met up with us on board ship two days later. We extended our stay in Venice by 2days with hotel stay 3min. from Saint Marks Square which also offered complimentary water-taxi to Murano. Embarkation and disembarkation went without any delays; both in Barcelona and Venice. Our cabin-mid ship, Deluxe Veranda, which we saw briefly on a daily basis was very comfortable. Being avid dancers we enjoyed the sounds of Oaseas in the Torshav Lounge with Christina, Speedy and band. Polka was not in their repertoire but their keyboard player came up with the Beer Barrel Polka and the following night they played several Polkas - they were great. Other shows included a tribute to ABBA; The Long & Winding Road dedicated to the Beatles; Songscape: An Operatic Fantasy and more. You&apos;ll find unlimited activities on board ship throughout the day and evening. Enjoy the sounds of the Viking classical Trio, resident Guitarist or resident Pianist in the expansive and beautiful public Atrium. Relax in the Living Room, enjoy a drink with friends in the Explorer&apos;s Lounge, Aquavit Bar or Pool bar. Stay fit by using the well equipped fitness center; choice of three pools; Nordic Spa; Shuffle Board etc. Dining at its best - the choice is yours Manfredi&apos;s, Italian cuisine; The Chef&apos;s Table;The Restaurant, fine dining and the World Café, cafeteria style. Snacks and Lunch is also served at the Pool Grill and Mamsen&apos;s.
Service throughout is exceptional. You&apos;ll find the Staff attentive, helpful, determent to please with a smile. If there is problem or certain need, they will aim to fix it resolve it quickly. Our schedule in regards to shore excursions was extremely busy...by our own choosing, which made it difficult to attend several of the on board activities we would have liked to attend as well. We had excellent, knowledgeable guides on all excursions we took - they ranged anywhere from 1 1/2 to 10 1/2 hours. Best way to truly enjoy your shore excursions is read up on the area in advance so you can make the most of the time in each area. Be prepared for steps and more steps. Anticipate crowds. Dress comfortably. We had a very mindful guide who did avoid certain areas in Barcelona at the time Catalonians were demonstrating in the city center. The weather was a fantastic....daily Sunshine, Blue Sky, Calm waters and daytime temperatures in the mid 70F. Our "three couple party" enjoyed a most memorable Dinner arranged at the Chef&apos;s Table by Tom Aberg, Hotel General Mgr., Martin Kitzing Executive Chef, Emir Tursik, Restaurant Supervisor- our attentive server at our celebratory Dinner; and Zrinka Kardum, Restaurant Manager. We each celebrated 55years of wedded bliss....making it a total of "165 years of Marriage!" Will we sail on another Viking Ocean Cruise? I&apos;m quite sure we will .....already glancing through the catalogue. 270sq ft - mid ship. convenient to stairs and elevators. Comfortable bedding, Bathrobes and slippers in cabin. Closet space adequate for 2, 2night stands with drawer and storage. Room safe, 4 small drawers. Two lounge chairs, cocktail table, desk. Good size bathroom with shower. Suitcases store under the bed. 24hr room service. Very attentive room Stewart. again beautiful scenery, the "capri" of Corfu! Would recommend this tour if you can not do Capri. Approx 10 pax per boat, entered three caves by boat, crystal clear water. Time to walk and enjoy the old town of Corfu. Second visit to Dubrovnik.....was curious what it would be like after the war. It&apos;s beautiful, little sign of any conflict. Loved walking through the old town, great lunch and did take the "new" cable car to the top with the magnificent view of Dubrovnik and the surrounding area. Well worth it! should be a must for everyone. There is quite a bit of walking involved but not as difficult as the guide made it sound. There are stairs but you have enough time to make the circle on the tour. If you go to the main Water Falls you truly miss out on so many smaller waterfalls. We continued on a boat tour and lunch before returning to the ship. quick water-taxi ride. Welcomed by Murano representative. Entertaining guide explaining the origin, history and making of Murano glass. Toured the Show room of Chandeliers (not for the average house hold- rather eccentric for our taste), but many beautiful, classic Vases, Bowls and Sculptors and Jewelry.